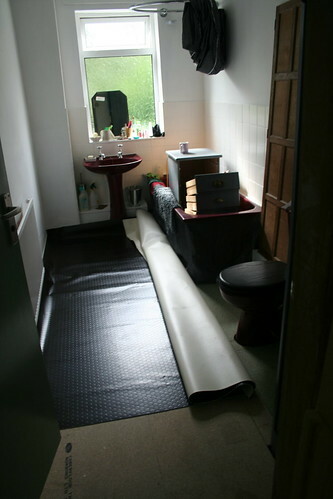 To make up for a looong blog absence, I am going to talk about my toilet. You may have wanted sewing stories, but no, you get bathroom diy. When I bought my house back in April, the bathroom looked like this. This room has taken masses of work, probably more than any other room. But it hasn’t taken a massive lot of money. I thought about replacing the suite, of course I did. But when I looked at bathrooms I could afford, I soon realised that I have expensive tastes, where toilets and basins are concerned. I didn’t like any of the cheap ones. What I really want is refurbished antique stuff. Which I can in NO way afford. So instead I decided to stick with refurbishing the 1980s burgundy horror. It was almost a challenge. 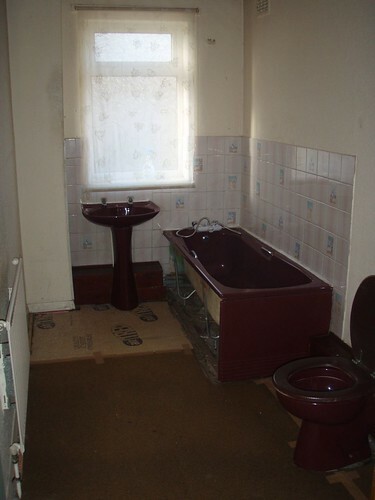 If i can make this vile bathroom look good on a budget of next to nothing, I will be pleased. 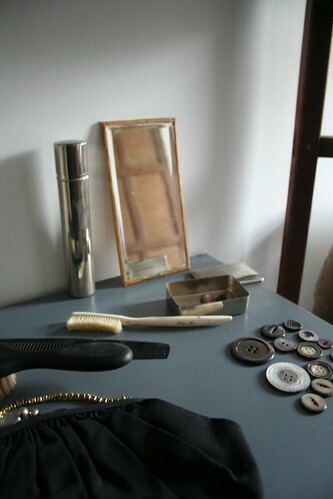 Sorting it out was my first task when I got the house keys, making it bearable to live with in the first few weeks. Out went the underlay, down came the roller blind, off came the woodchip wallpaper. Off came quite a lot of the plaster as well. Ho hum. 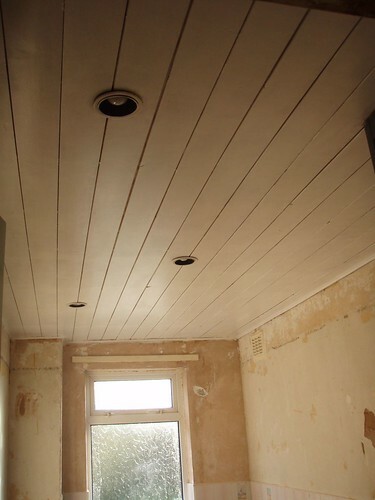 I decided to keep the tongue and groove ceiling, airing cupboard and badly boxed-in pipe arrangement, simply because I couldn’t afford the work of removing and replacing them – and I needed to keep the bathroom functional. 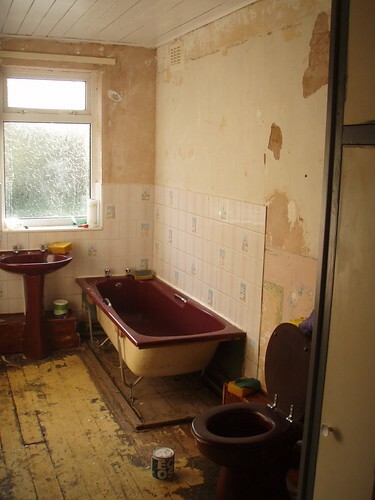 Same for the tiles, vile though they were. One-coat tile paint. Which required 3 coats. But it worked. Eventually. This was a labour of desperation. Removed all the old silicone sealant around the bath which was a slow and unpleasant job involving a stanley knife and my trusty scraper tool which has been used for almost every project. Sanding the ceiling. Varnished pine is not a look I am fond of. Sanding the ceiling is not a job I ever want to do again. I borrowed a small electric sander from my dad which completed the job and then died. I don’t blame it. Then I bought a new electric sander which is about a quarter of the weight and would have been infinitely easier to sand the ceiling with. Oh well. Stripping the paint from the door frame and smidgen of original Victorian skirting board under the door. This is almost the only original feature left in the house, so I wanted to clean it up. It’s not finished. 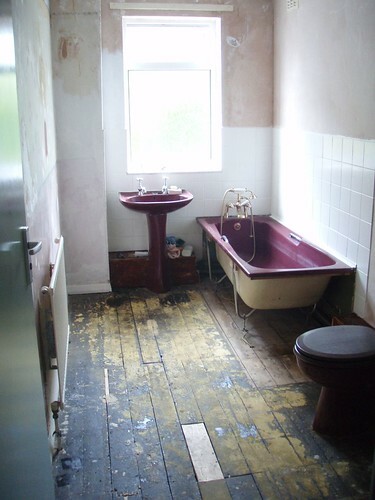 There is also a bit of lurid green skirting board behind the bath. Oh god, under the bath – sweep, hoover, hoover again. And then hoover a bit more. Almost clean. Get rid of disintegrating underlay (there was nothing on top of it when I moved in) & replace temporarily with the lovely turquoise carpet from the bedroom. It was better than the ruined floorboards, marginally. Remove all the carpet grippers from the floor. I have removed approx 78 million miles of carpet grippers from this house. Hateful spiky things. I should have had a bonfire with them. Had new taps fitted buy plumber. I say new, they were 2nd had from ebay & my plumber couldn’t decide whether to be impressed by the price or annoyed at having to fit 2nd hand taps. Either way, buying them on ebay meant I could have nice taps at less than the price of the cheapest crappiest basic taps he offered me. It took some time to get the ones I wanted, but it was worth it, even if they don’t match. Chrome basin taps were £7 inc post and the bath / shower set cost a total of £20, compared to £100ish for similar new ones – and these are good brands. I got to be a bit of a tap geek. Just you wait til I get to the kitchen one. Wow. Bargain of the year. 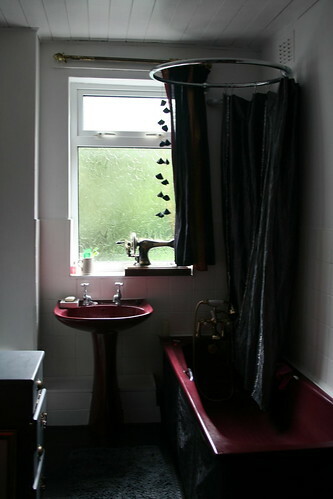 Top tip for old baths – also replace the plughole and overflow pipes – it looks so much better and there is none of the ick plughole grimness to deal with. The whole set cost £1 on ebay. And I have a gold bathplug, which is slightly hilarious. Paint the ceiling. This took 4 coats of white satinwood. Sarah did 2 of them and for that I am eternally grateful. It was a nightmare job. 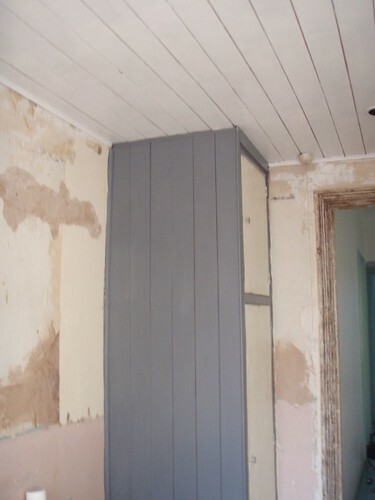 Paint the remaining woodwork – airing cupboard in slate gray to match existing furniture and rest of it in white. The white took 5 coats to cover the mahogany varnish on the pipe boxing. The floor. Oh the floor. The original floorboards were covered in black sticky glue and bits of old vinyl tile, nails, bits of carpet and all manner of crap. And were full of holes and stuff. Not good. It took a while to work out what to do with the floor. If the floorboards weren’t so damaged I would have hired a sander and taken off all the crap and varnished / stained/ painted them. But they were not good enough for that. So after going round the houses many times, I opted for covering them with chipboard as a base for vinyl. I had actually seen the vinyl I wanted in a local carpet shop just around the corner at a bargain £5/m. Normally I hate vinyl flooring, it is plastic and crappy and generally very ugly. 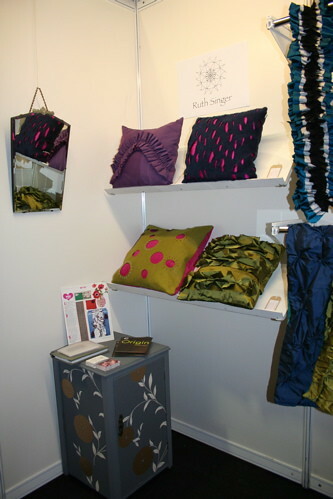 But I couldn’t afford anything better or more eco, so having spotted some I actually like, I decided to go for it. 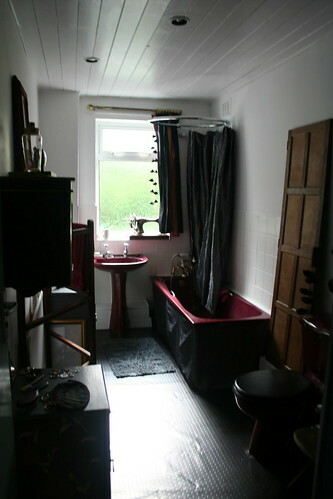 And so the black flooring helped set the slightly goth theme along with the red suite. By the time I got around to buying it, all they had left was 2 remnants – close shave. So I had to buy rather a lot more than I needed, annoyingly. But still. Black flooring secured. One roll lived in the bathroom for months, the other in the living room alongside the skirting boards I bought months ago in some fit of enthusiasm. And the chipboard. My mate and I spent an entire day battling the stuff. It was not fun, in any way. I really, really, really hated that job. It took hours. 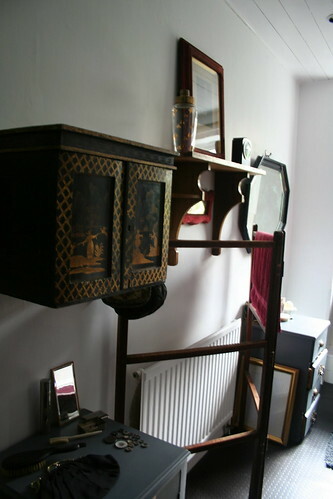 It cost a lot of money (relatively – about £50) and it was hard work. And I paid my friend to help. But it worked! It is flat, will be squeak-free soon, and is flat, smooth and insulating. Hurrah! (no more toilet noises audible from downstairs). Then comes a hiatus of several weeks / months while I did up my bedroom & studio so I could move into my bedroom and out of the to-be-studio in time to move out of my rented studio in June. That was fun. Then another hiatus over the summer while I have been stupidly busy with work. Then the bank holiday, the traditional DIY weekend. Painted the walls. Finished the wood work. Re-did the silicone sealant around the window frame and around the bath. Also used it to fill the weird gaps in the ceiling that leak loft-crud through. Nice. Painted again. And again. SO many coats of paint, the bathroom must be several mm smaller than before. 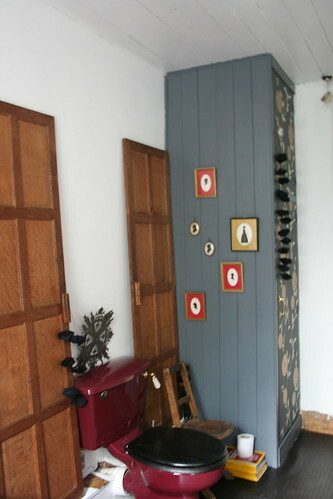 And then wallpapered the airing cupboard doors, to match the existing refurbed bedside cabinet which I made for my first ever trade show in 2006. 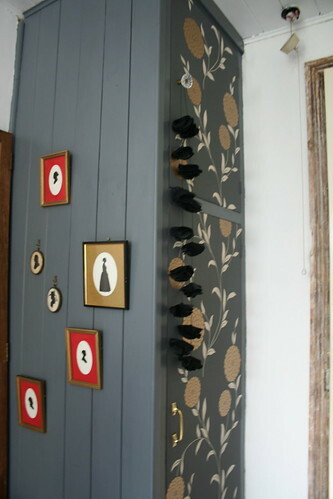 It’s Laura Ashley Erin wallpaper in charcoal. I wanted to buy the fabric for curtains, but it’s silk and massively too expensive for even a tiny bathroom curtain. But back to the wallpaper. It’s fab. I think i will use it to cover the bath side panels when i get them. 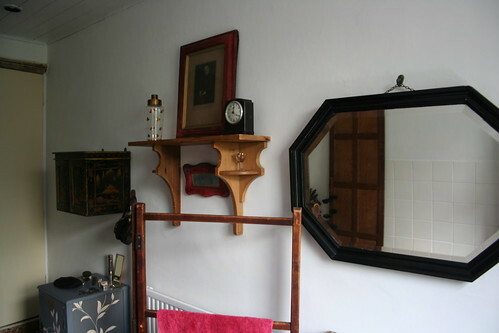 And I will also use a length on the wall above the loo between the oak doors. And then finally, yesterday, I laid the flooring. I was sort of dreading this job. And then once I started, and had lugged the massive roll up the stairs, I thought it was actually going to be fun. It wasn’t. I am not good at cutting vinyl, it doesn’t behave like fabric at all. I very nearly cried. It’s a bit rubbish in quite a lot of places and I have had to fill some gaps and colour in the edges with a black pen. But it works. I finished it last night as was feeling just about happy with it when I dropped the electric drill and made a hole in it. Fabulous. Black felt tip to the rescue. Also did that with the loo seat which had a small chip in it. Sigh. 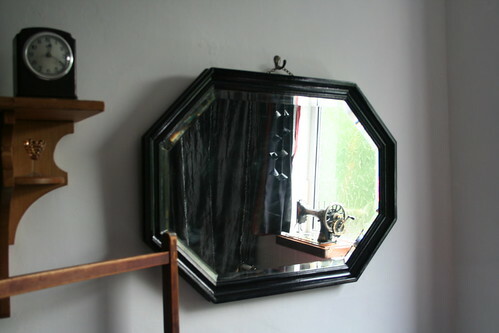 Then I drilled holes in my lovely lumpy walls to hand mirror, cupboard & shelf. And late last night I decided to make a curtain, and then couldn’t stop with the decorating, styling, arranging dust-collecting nick nacks, faffing, whatever you like to call it. I’ve run out of steam and will shut up now about my bathroom. There is still more I intend to do, like some frosting on the window, decorative doodahs and a new light pull. Oh and a new door, we still have the crappy plywood one for now. New (old) one is in the shed, awaiting dad visit. Final few photos below and the whole lot on Flickr with notes about all the bits and pieces, what they are, where they came from and how little I paid for them. Maybe you can play guess what the most expensive single thing in the room was. Which was also the first thing I bought specifically for the house. it looks lovely-I have done a bathroom or three and know your pain. 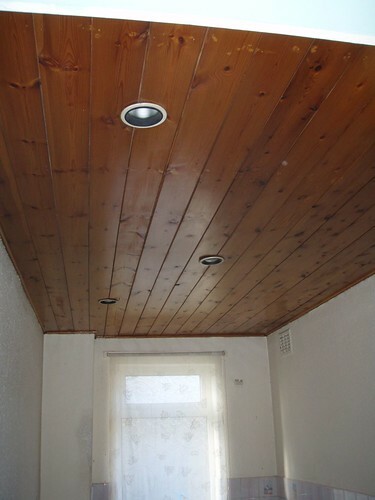 As much as work as the ceiling was I think it looks fabulous and the airing cupboard looks especially great too!!! Wow! What an achievement. All you need now is some lovely bubble bath and a scented candle – I wonder if you can get black ones? No pic of the gold bath-plug though: I was hoping to see that on Flickr!